Ramona teaches English as a Second Language in a private school in Austin, Texas. As the fall semester opens, she welcomes the usual students, immigrants who need to learn about life in America. It’s when the last student comes to class (late) that her life begins to turn upside-down. This student is Leonardo da Vinci. He’s twenty-five years old, six-foot-three, drop-dead gorgeous, endearing—and broke. Taking pity on him, Ramona lets him move into her late husband’s studio in her backyard. 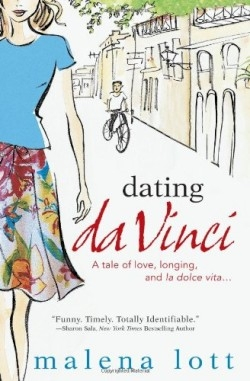 Pretty soon, da Vinci (note that Dan Brown erred in capitalizing the D in da Vinci) moves into her heart. She helps him with his English and invites him to eat with her and her sons. Pretty soon, he’s cooking for her. Pretty soon, they’re kissing and petting. Pretty soon, they’re making love. By Christmas, Ramona’s life is fuller that she ever imagined. As she’s finishing her doctoral dissertation (in record time!) on “the language of love,” she’s also learning about the permutations of amore. She deals with unfinished issues with the woman Joel almost married (who married his best friend) and finds herself irresistibly attracted to the handsome physician her mother tried to fix her up with but who is suddenly “with” her sister. After two years of widowhood, she buys new “funderwear,” and a new bed. Ramona cleans out Joel’s clothing, and discovers that Christmas can indeed be merry again.